I was expecting this story to be the season's lemon, since I despise the work I've seen by Richard Curtis, but last week's trailer gave me pause. It looked pretty good. Two reviews posted on Friday also gave me pause. 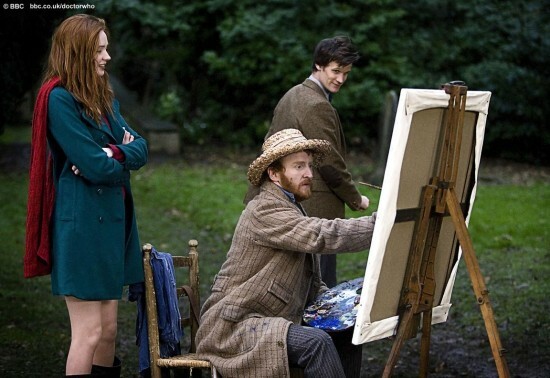 One thoroughly trashed it ("If the Fourth Doctor saw this episode, he'd write 'This is a fake' on every canvas", declaims the critic) while the other awarded a perfect rating. Other reviews since then have shown a consistent pattern: those who hate the story do so with a perfect hatred (Ps. 139:22), while those who love it can't find enough ways to say it. So what's the deal? The latter have it right. Curtis hit a home run. It's a character piece above all, about a tormented genius who has visual acuity beyond the norm, and is trapped in a world of pain. If artists are destined to be stereotyped as cracked misfits, it's at least accurate in the case of Vincent van Gogh. He shot himself at age 37, at the height of his artistry and churning out paintings at breakneck speed. The story represents this period of Van Gogh's life quite well, recreating various sites painted by the artist, the paintings themselves in arresting color, and his disturbing fits of manic depression. That the BBC decided to broadcast helpline information over the rolling credits ("If you've been affected by the issues raised in this program, and you'd like support, call the BBC Action Line...") has been scorned, but I thought it was a kind enough gesture. The ending is emotionally intense and could potentially cause pain to those similarly depressed, and Doctor Who is a family show. I can think of other things to heap my derision on than humanitarian sensitivity. Such as Murray Gold's scoring. The man should be shot for playing Athlete's "Chances" over the final museum scene, which is emotional enough without the added pollution of a rock ballad. The offensive song spoiled what could have been a 5-star episode. Murray Gold has blown it before, but in Vincent and the Doctor his musical ear hits an all-time low -- near the equivalent, dare I say, of Russell Davies' scriptwriting crimes in the season-four finale. Everything else about the story, however, particularly the bulk of it set in 1890 Provence, is perfect. The theme of vision permeates every frame, as we learn that Van Gogh can see things others are blind to. On the literal level this plays out in the attack of the Krafayis, an invisible giant bird-reptile that Vincent fends off entertainingly with long wooden poles and armchairs. It is quite amusing to watch the Doctor futilely emulate Vincent's thrusts and parries against the creature, as he of course never hits the thing and succeeds only in getting himself slammed against the wall by its tail. His special mirror device which can spot invisible objects is also a nice touch, and we end up seeing just enough of the beast at the right moments lest we grow tired of the spectacle of Vincent and the Doctor combating thin air. On the deeper level, Van Gogh sees things in nature's midst and people's souls. 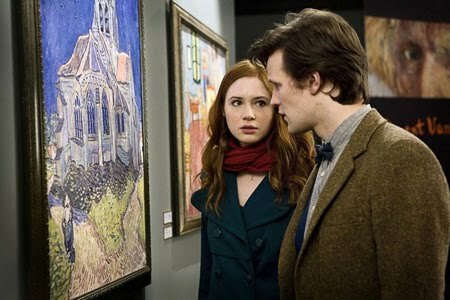 Wonderfully realized is the scene involving the night sky transforming into the artist's Starry Night canvas, which the Doctor and Amy can see too since they're linked to the vision by holding Vincent's hands. Van Gogh can also see that Amy is sad though she doesn't know it, crying on the inside, over the recent death of Rory tragically forgotten. Curtis has the wisdom (and mercy) to not allow time to be rewritten to the extent that Van Gogh postpones his suicide. The overwhelming joy he is given by experiencing posthumous fame is transitory, and even leaves us wondering if his fate remains on course because of this, rather than despite it. (How is one supposed to go back to living a mundane life wholly unappreciated and a commercial disaster after such escapades with the Doctor?) Yet a few time ripples have been stirred. The Krafayis has disappeared from The Church at Auvers painting; the museum turns up a new Van Gogh piece dedicated to Amy; most importantly, as the Doctor says, he and Amy added to Vincent's "pile of good things" in life even if they couldn't save him. 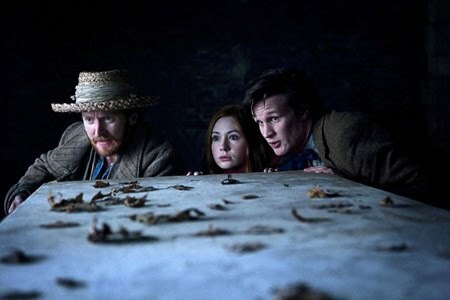 Vincent and the Doctor is a standout achievement, and adds plenty to the "pile of good things" in season five. Thanks for the interesting review, Loren. I thought this episode pretty near perfect. A definite 5 and one of my favourites of the new series. I phoned in to Podshock yesterday to gush about it. With respect to Murray Gold, are you sure that he is responsible for the sound / music editing? I often hear people complaining about Murray Gold when it may well be the director / music editor who are to blame (if there is to be any blame). For what it's worth, though, I loved the way they did that stuff at the end. A gorgeous episode. What other series can deliver gems like this? And such variety within the same series. Fantastic.